African Group Tries to Deter Illegal Immigration. The group is called “No More Death in the Desert or on the Sea.” Its mission is simple: to educate youth in Africa about the harsh realities of illegal migration. Migrants aboard the Golfo Azurro rescue vessel wait to be transferred to Italian authorities in Trapani harbor, on the Italian island of Sicily, Saturday, April 8, 2017. 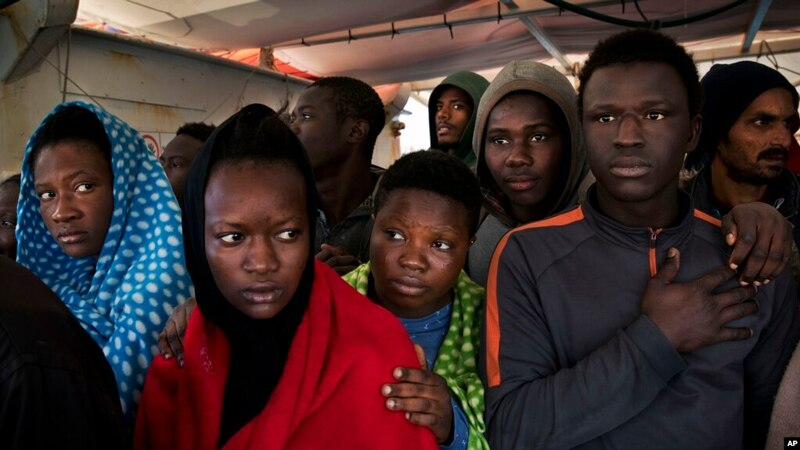 The Italian coast guard says it has rescued nearly 6,000 migrants on the Mediterranean since Friday, underscoring the continued flow of people along this dangerous route. A group of Africans living in Europe visited Cameroon this week to launch a campaign against illegal migration. The group is called “No More Death in the Desert or on the Sea.” Its mission is simple: to educate youth in Africa about the harsh realities of illegal migration. "We want to tell them that all the information people give them before they start their journey are wrong," said Nantcha. The group’s leader Sylvie Nantcha was born in Cameroon. She has lived in the German town of Freiburg for 25 years. She arrived as a student and rose to become the town's first councilor of African descent. “I made a lot of interviews last year with Africans and they told me that when they started their journey, they thought that the journey will take them may be just two weeks, but they were one year or two years or three years on their way to Europe and they spent more than 10,000 euros," she said. "They had other wrong information like if you arrive we will give you a job, and they arrive in Italy in Spain or in Germany and they don't have a job." Nantcha joined forces with nine other Africans living across Europe to tackle the trend. They plan to visit Nigeria, Kenya, Ghana, Niger, Algeria and Libya by the end of this year to screen a film based on Nantcha’s interviews with migrants. Hundreds of people gathered at each of the three screenings in Yaounde this week. The goal of the film is to deter illegal migration. But youth at the event told VOA they know the risks already. Some of them said a lack of jobs and Europe’s restrictive immigration policies leave few options. 24-year old Nguenang Bruno says films alone will not stop Africans who believe that the only way for them to make it in the future is to sacrifice and cross the desert and sea to Europe. He says the will to leave is strong and it will take work to change that. The young people in the audience cited stories of people they know who made it to Europe illegally. But in Yaounde it is not hard to find other Cameroonians who failed. 29-year old Robert Alain Lipoti cleans dishes in his restaurant at Etoudi neighborhood. His uncle loaned him the money to start his business after Alain returned from his sad adventure across the desert trying to make it to the Mediterranean. He says he ran short of food and water when he spent three weeks trekking in the Sahara desert. He says he saw people dying by him and there was nothing he could do to help. He says while in the town of Damara in Algeria, he had to escape police and then he trekked many kilometers to Morocco where he couldn’t go out in public or work because his stay was illegal. Despite the difficulties, VOA spoke to returnees who say they will try to migrate again. Milingui Biya Paul, 35, made it to Algeria but was scammed out of his money. He had to take odd jobs to raise transport fare to go home. He says Cameroon like other African countries buries young peoples’ talents. He says after finishing their studies, people still do not have jobs. He says why should he dream to stay in Cameroon when there are opportunities outside? Paul hasn't ruled out trying to make the crossing again.